Mark’s passions are to unify high capacity families around a significant common purpose and elevate their positive social impact, as well as highlight creative ways to invest in a family’s next generation. Since 2008, Mark has been a family office executive for KNET, a consortium enterprise that serves as the family office for Steeve Kay, a software entrepreneur in Orange County, CA. Mark was Executive Director of Kay Family Foundation from 2010-2013, and is currently Vice President, Strategic Relations. In addition, he is Principal of Next Generation Strategies, an independent, conflict-free philanthropic advisory firm. NGS serves client goals to: 1) prepare the next generation to assume family leadership and the responsibilities of wealth, and 2) more effectively invest social capital into worthy ventures. In this capacity he serves as an advisor to the Oates Family Office in Sacramento and is a Director of the Marvin Buzz Oates Charitable Foundation. 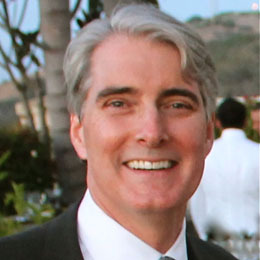 Mark is Chairman of OC Advisors in Philanthropy and was one of the co-founders of the group in 2010 (www.ocaip.org). He Chairs the Workforce Development Committee of the OC STEM Initiative, a funder’s coalition spearheading STEM (science, technology, engineering and mathematics) literacy in OC. He also is a board member of ChildSHARE, the largest independent foster parent recruitment organization in the U.S., finding “forever” homes in Southern California for abused and neglected foster youth. Mark received his BA from Stanford University, MBA from Yale University, and is a Chartered Advisor in Philanthropy (CAP®). From 1986 to 2008 he held executive positions primarily in privately held firms – including president of a family business that strategically empowered US companies, including AT&T, Motorola, Westinghouse, and United Technologies, to expand in emerging market economies. Mark lives in Aliso Viejo, CA with his wife of 37 years, Leslee. They have two married adult children and two grandchildren.